Posted April 15, 2016 by The Rapid & filed under Events. We need your input as we continue designing the Laker Line! 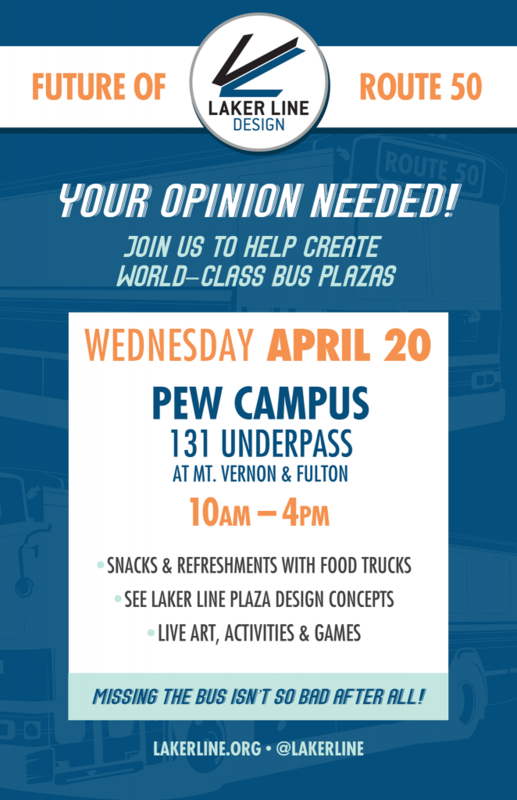 The Laker Line, Grand Rapids’ newest bus rapid transit (BRT) line, will hold a public open house event on Wednesday, April 20 on Fulton Street under US-131 near Grand Valley State University’s Pew Campus. The event, which runs from 10:00 a.m. to 4:00 p.m., seeks to solicit public feedback on proposed station amenities and locations near the downtown campus. We hope to highlight station features to potential users as well as demonstrate proposed new crosswalk locations, and survey users on safety concerns. This event will take place rain or shine. Attendees should also come hungry as there will be two food trucks, Patty Matters and RIX STIX Pronto Pup, serving up delicious food. Visit LakerLine.org to learn more about the future of Route 50 and the Laker Line.